Asparagus is a perennial vegetable. It takes three years from planting to get an appreciable crop, but the fresh asparagus is well worth the wait. A well-maintained asparagus patch will yield for 15 to 30 years. The bed should receive plenty of bright, direct, full sunshine. The plot should not be subjected to digging or tilling. Asaragus can yield 10 to 20 spears per plant, and they should be planted a foot apart, so be sure to choose a plot spacious enough for the yield you want. Remove all weeds if necessary. Till the ground to a depth of 12 inches. Place three inches of compost over that and till to mix it thoroughly with the dirt. Finally, till in the fertilizer. A mixture of 10-20-10 applied at the rate of two to three pounds per 20-foot row is usually recommended. Now you are ready to plant your asparagus. 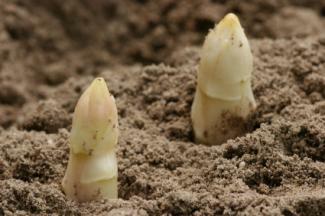 Asparagus should be planted in the fall to give it time to get rooted well before it goes dormant in the winter. Planting it in the spring is possible if you live in the Northern United States, but Southerners will find that spring planting leaves the plants too tender to survive the summer heat. Dig a trench along each row that is six inches deep and four inches wide. Place each crown in the trench, being careful to spread the roots out in the trench. Allow one foot between the crowns in the trench. Cover the crown with about two inches of soil. As the shoots grow from the crown, continue filling in the trench so that the shoots just barely peak through the dirt. You should have the trench filled in by the end of the first year. Growing asparagus is definitely for the more patient gardener. While your first year will yield shoots, you'll have to wait a whole three seasons before you can harvest your vegetables. 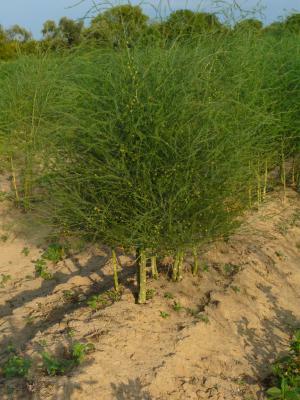 During the first year, do not cut the asparagus shoots. They need to be allowed to grow into the asparagus ferns that feed the roots so they can survive the first winter. Water the plants weekly, giving them one inch of water each time. When winter comes and the asparagus ferns die, cut them, and discard them to prevent the spread of the asparagus beetle. After cutting the ferns from the asparagus, spread three inches of compost on the asparagus bed. Fertilize with a mixture of 10-20-10 fertilizer at the rate of two to three pounds per 20 feet of row. When the asparagus plants sent up shoots, you can cut the ones that are thicker than your finger. As soon as the shoots become smaller than this, quit cutting them. Let the shoots become ferns and grow until winter, when you cut them back to the ground. Water weekly, giving the plants one inch of water each time. Treat the asparagus bed as in year two. 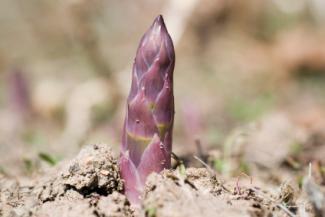 You can harvest asparagus shoots until they become as thin as a pencil, about six to eight weeks each year. When the stalks become as thin as a pencil, then allow them to put out ferns. Continue to water weekly, giving them one inch of water each time. Cut back the ferns each winter. The major problem for most asparagus beds is weeds. Since you should not hoe or rake around the asparagus plants, the only solution is to pull weeds by hand. If you don't pull weeds growing among the asparagus, the weeds can either take over the bed, and dominate the asparagus or sap vital nutrients from the plants. The tall, fern-like fronds are actually produced by the asparagus plants themselves; don't mistake them for weeds. The frothy plume-like foliage produces food for the plant each year and is vital to its health and success. If you continue to care for your asparagus bed diligently, it will deliver delicious shoots each spring. Although asparagus takes a little patience in the beginning, it is well rewarded with the harvest you will get each year.